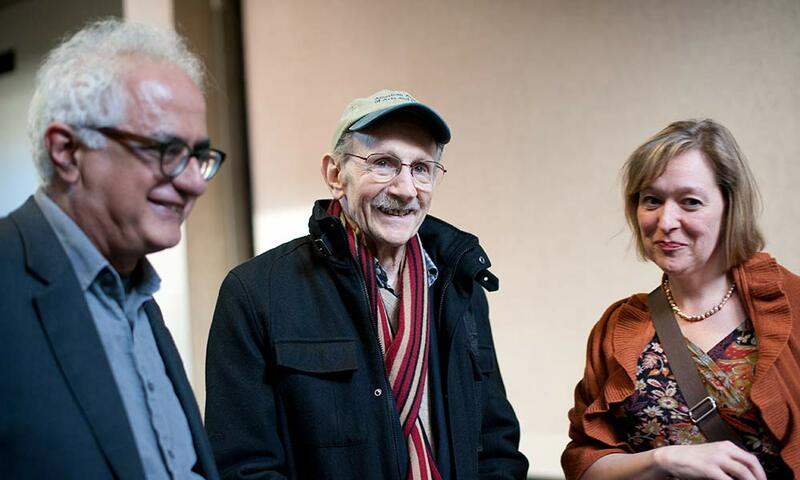 Philip Levine (US Poet Laureate, center) with University of Rochester English professors Jennifer Grotz, right, and John Michael in Hutchison Hall during a visit to campus April 12, 2012. From the archives: Philip Levine, former poet laureate of the United States, was a keynote guest when the Department of English’s Plutzik Reading Series celebrated its centennial in 2012. The Pulitzer Prize-winning poet died Sunday at the age of 87. Below are clips of Levine reading selections from his poetry during his visit to campus.